I kept the quilting simple, first just doing SITD with my walking foot. I used the same orange variegated thread I'd used on the quilt. Last night, at exactly this moment in quilting the cushion cover, I received a text from Dayna's sister-in-law, Casey. Casey loved the quilt from the beginning through all the QAL stages last spring, often commenting on my Insta posts. She was an incredible support to Dayna through the wedding planning process, even flew from her home in Nashville up to Detroit for Dayna's bachelorette, for which she did most of the planning. She organized an incredibly thoughtful gift of a book of photos with accompanying notes, well wishes, advice and memories from Dayna's closest friends and family. She it was also, who, with Tyler, flew Dayna and I to Nashville in February 2018 to shop for a wedding dress. She and Dayna have been close all along, and I wanted to thank Casey in an extra-special way for all she did and how much it meant to me that she cares so much for Dayna. 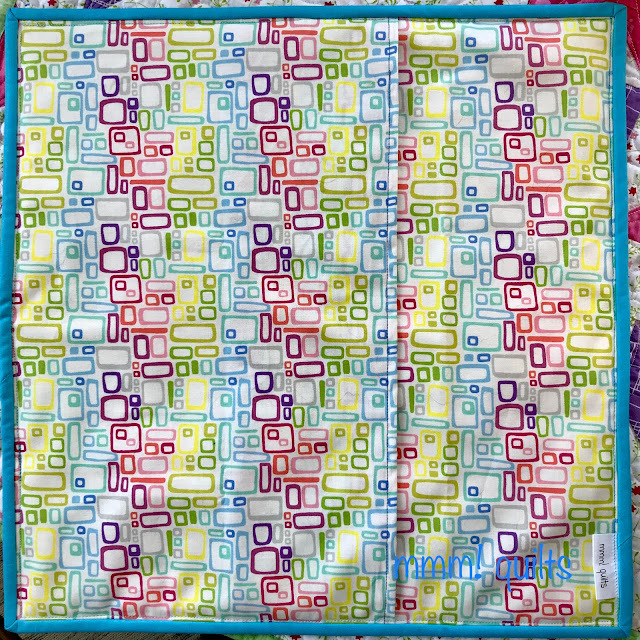 In December, shortly after the wedding, it came to me that this quilt, which Casey so loved, needed to go live with her. This was what she sent me, with a few GIFs of happiness and squealing. She'd just received it yesterday. Why nearly four months after I'd had the original thought? Well... Casey was coming up here for Christmas, but it didn't happen, due to her kids being sick. Then Dayna and Tyler went down there in February, so they were taking it along with their presents, except they forgot to take not only the quilt for Casey, but their presents!! Dayna finally mailed it off for me last week. When Bernie of Needle & Foot sent me the kit I curated for the Beothuk Star QAL, (another post coming tomorrow), I had to add a couple of items to the package; I mean A. it would be rude not to, as my good friend Helen says, and B. stuff as much into that flat-rate envelope as you can, right? I saw this fabric in Bernie's shop, and knew it would make a great binding for an RSC quilt. Then, when I was thinking about a cushion back, I spotted it, and bingo! Perfect! I can see much more of it this way than just as a binding -- bonus! I like the envelope-style cushion back, and I always bind my pillows. Cushions. Whatever. All good. It just gives them a crisp finish. I used the same binding as I did on the original quilt. Love that robin's egg blue! 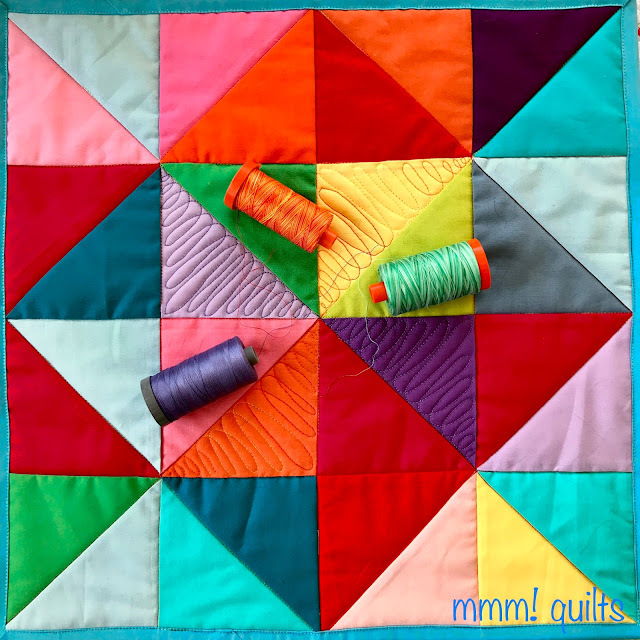 It's a wonderful solid from Paintbrush Studio, and one I used in my In the Shadow of the Plus quilt that was in the September issue of Modern Patchwork last year. I stitched it down with the variegated aqua thread. It's a fairly poofy cushion form inside, yet there's enough overlap that you don't see the form. Tip for figuring out how big to cut the two halves of the back: I usually find the centre of the top, so this was 8.25" and then add about 3.5" to that and cut two pieces that measurement, so in this case, 16.5 X 11.75", meh, make it an even 12". A little extra, like dessert, can't hurt! I used three Aurifil threads I've purchased for the quilting. I'm really liking their 28 ct. It's kind of cool how, when it's on the pillow form, you get a circular shape! Threads: pieced on Billie, my 1947 Featherweight; quilted with Aurifil, 28 and 50 wt, Gütermann and Aurifil 50 wt in the bobbin. Binding stitched down with aqua variegated Aurifil. 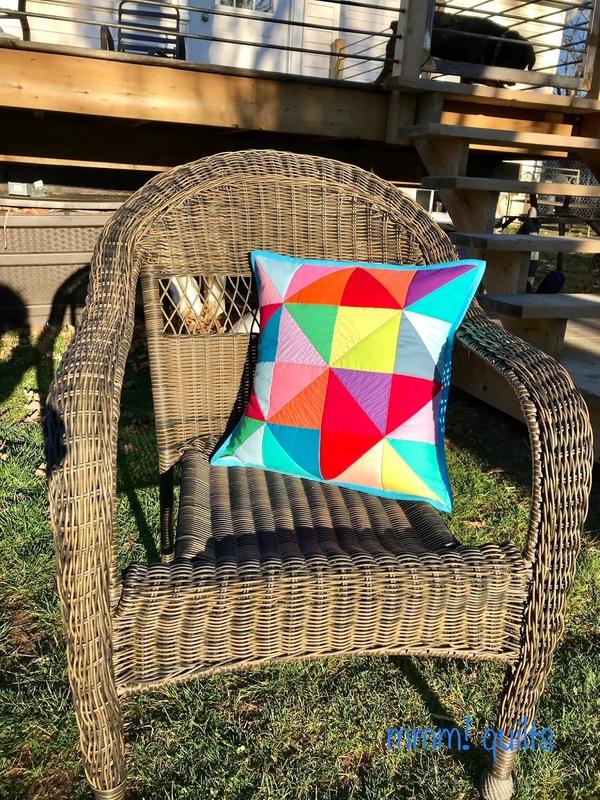 A beautiful cushion to remind you of that wonderful QAL you led us on. I've saved my leftovers for another yet-to-be done project. Hmmm! Maybe I should get started! Sounds like the postcard quilt has the perfect home. I like the cushion back fabric and could see it used in a quilt front. Love the cushion and that wonderful secondary circle. It is always fun seeing little projects from the big ones. I am glad the quilt and gifts were finally delivered - and so well received. How thoughtful to take care of Dayna’s good friend. I love the pillow, the backing and the surprise circle! Nice to see Bella enjoying time with you in the sewing room. She looks so sweet. 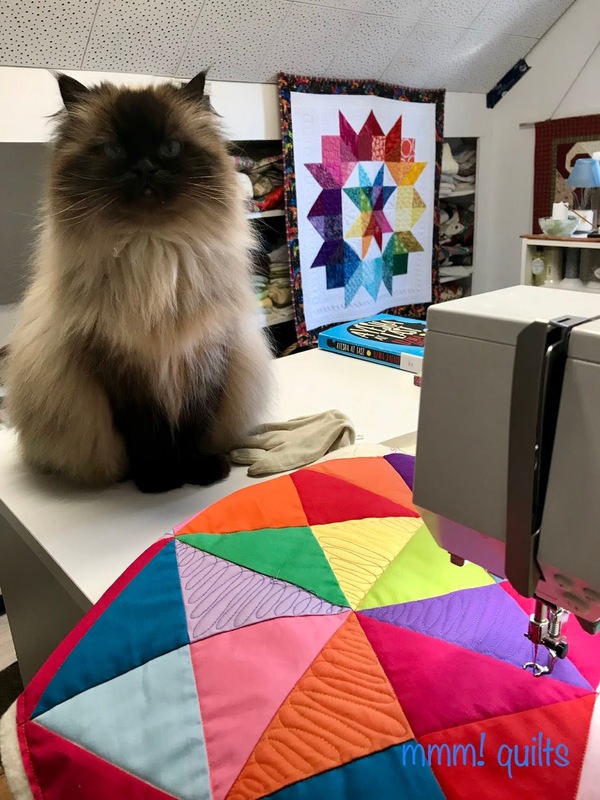 Lovely of you to send the quilt along to your daughter's special friend, and now you have a lovely cushion to remember it by. It does look like a circle. Great finish. 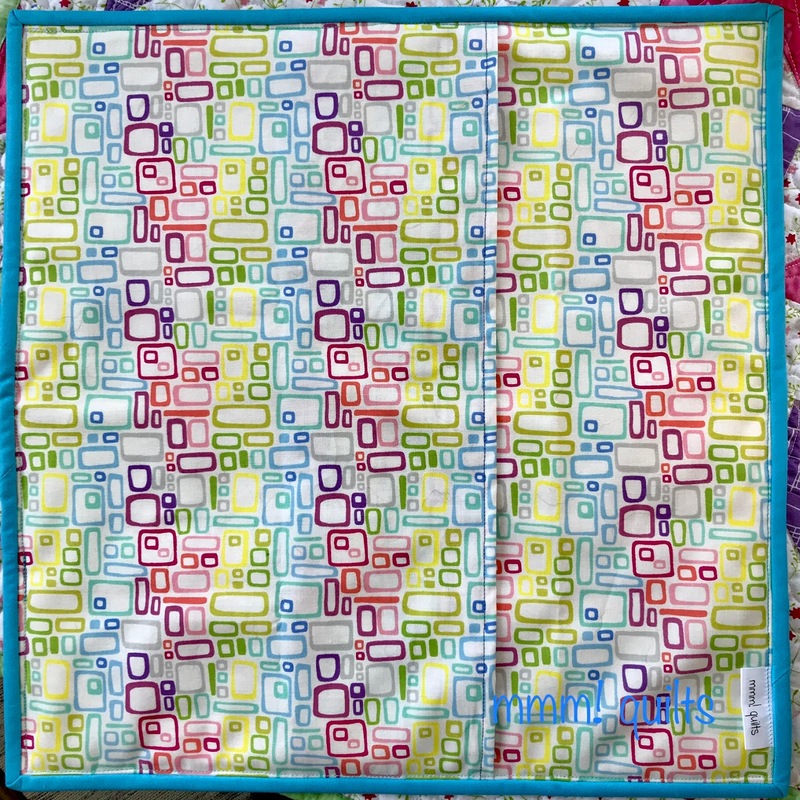 THANK YOU again for the quilt & all the kind words! �� I can’t wait to decorate Aliviana’s “big girl room” around it! Casey sounds like an amazing sister-in-law. So nice of you to gift her the beautiful quilt. I can easily imagine her being ecstatic after receiving it. Envelope cushion backs are my favourite and binding really gives a cushion a crisp finish. The cushion looks lovely, Sandra. I just noticed the circular shape too! 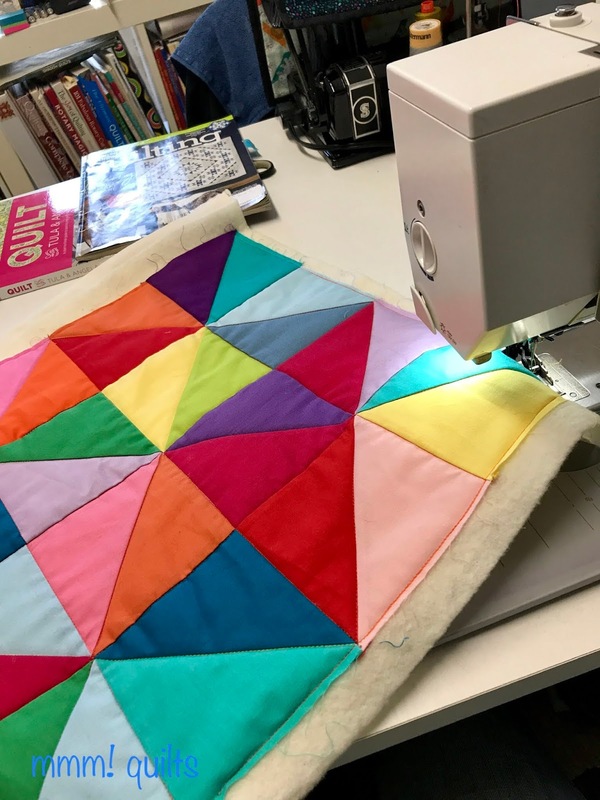 Lovely story, and finally the quilt found his home! 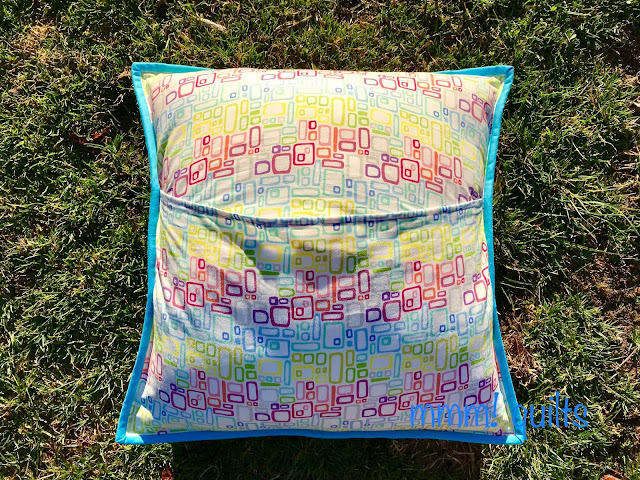 Love your pillow too, and the backing fabric! Hi, Sandra! Beautifully bright, happy pillow. I call it a pillow and we sit on a cushion. Love how the top looks like a circular shape even though it's not. I can so relate to your thought process, Sandra! 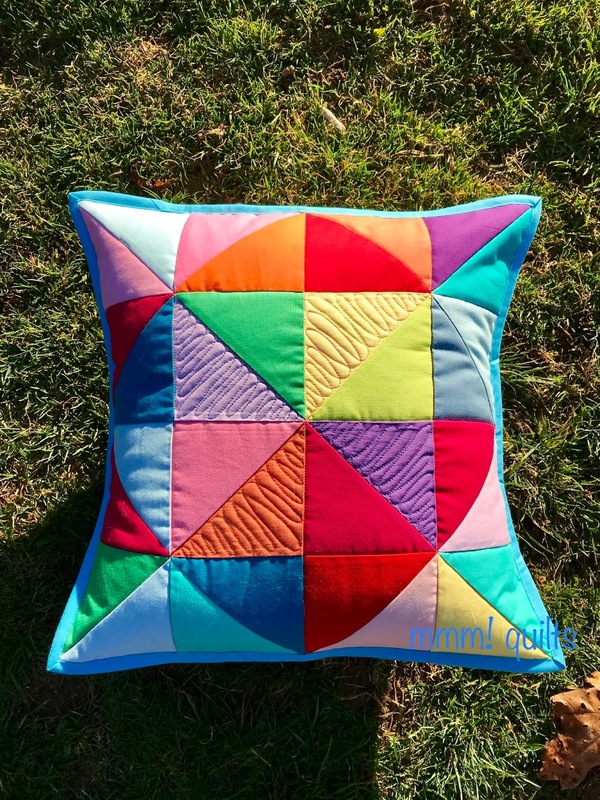 I love the quilting you choose for the cushion. I do the envelope style backing for pillows, too. But I never thought of binding a pillow + back. That's an interesting idea. I love the robin's egg blue, too. Beautiful cushion and amazing quilt! On behalf of the FAL crew, thanks for joining in! Great finish! The small projects are so satisfying.